Putting together a summer reading list? Images of America: U.S. National Library of Medicine, published a year ago this week in the popular series by Arcadia Publishing, is sure to please. Heavily illustrated with 170+ archival images depicting the Library’s growth and development through 200 years of military, library, and medical history, the book reveals the work of generations of visionary leaders and dedicated individuals who experienced the American Civil War, the world wars, the Cold War, and the dawn of the Information Age. Intensively researched by the staff of the National Library of Medicine History of Medicine Division, the book explains the evolution of the Library—supported by luminaries such as Michael E. Debakey and John F. Kennedy, surgeons general, senators, and citizens—into the world-renowned national resource it is today for public health information, medical data, and history of medicine. Watch the introductory film for Images of America: U.S. National Library of Medicine produced by Donald Bliss, Audiovisual Program Development Branch, National Library of Medicine, in cooperation with Jeffrey S. Reznick, PhD, Chief, History of Medicine Division, National Library of Medicine. During the event held at the launch of the book, NLM staff shared their experiences of researching the book, writing its chapters, and selecting its many images, and they took questions from the audience. Ken Koyle, Deputy Chief of the NLM History of Medicine Division, described his search for—and discovery in the National Archives of—the original 1836 document, which marks the beginning of the Library of the Surgeon General’s Office, the earliest NLM predecessor institution. In the context of the current era of data science, he also emphasized how the history of that institution, and particularly the work of Surgeon General Thomas Lawson around the collection of meteorological data, reflects an early, systematic effort to gather and organize data prospectively, rather than retrospectively. Dr. Stephen Greenberg, Head of the NLM Rare Books and Early Manuscripts section, discussed the Library’s conservation initiatives during and shortly after World War II, and, during the war, the preservation of the most valuable portions of its collection in Cleveland, Ohio’s Dudley P. Allen Memorial Library. And Dr. Susan Speaker detailed the construction of the library’s distinctive roof—architecturally speaking, a hyperbolic paraboloid—atop its current location on the campus of the NIH. Locations of the U.S. National Library of Medicine and its predecessor institutions, from 1862 to the present. 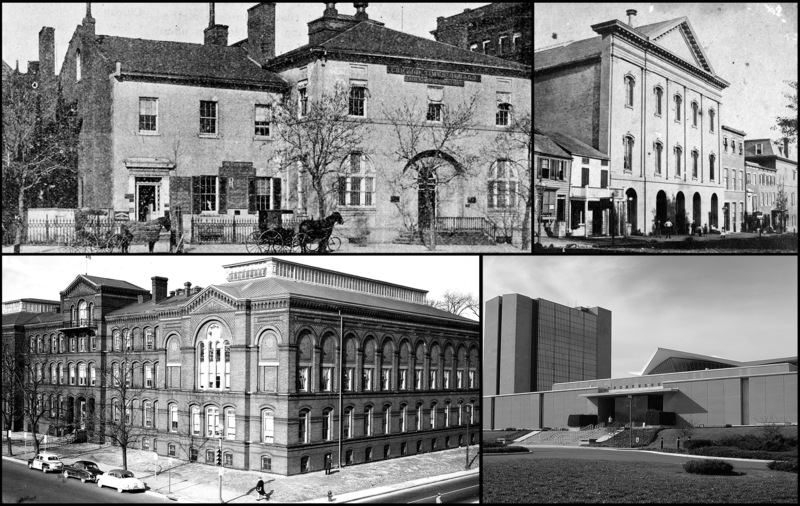 From top-left: Riggs Bank Building, Washington, D.C. (from 1862 to 1866); Ford’s Theatre, Washington, D.C. (from 1866 to 1887); from bottom-left: the “Old Red Brick” building on the National Mall (from 1887 to 1962); and the campus of the National Institutes of Health, Department of Health and Human Services, Bethesda, Maryland (from 1962 to the present). The complete book remains freely available in NLM Digital Collections, and the rich collection of images included is also there for you to explore. If you prefer to read it in print, Images of America: US National Library of Medicine is also available from booksellers. If one book about NLM is just not enough, check out Hidden Treasure: The National Library of Medicine, a book uniquely about the historical collections of the NLM, published in 2011 to help mark the 175th anniversary of our institution, and also freely available from NLM Digital Collections. With dozens of short, engaging essays from scholars around the world, this beautiful book takes you on a tour of some of the Library’s most important, rare, and unusual historical collections. We wish you a safe and enjoyable summer and hope you will add these free books to your summer reading list! And if you’re in the Washington D.C. area, come visit for a tour or to do some research in our world-renowned collections which span ten centuries and represent nearly every part of the globe. We warmly welcome you onsite and online! For more information about the book US National Library of Medicine in the popular Images of America series by Arcadia Publishing, explore the Circulating Now series “A New History of NLM.” A hardback version of the book is available from booksellers, and a PDF version of the complete book and original versions of the 170+ images, which appear in it in black and white, are archived and freely available in NLM Digital Collections. For more summer reading suggestions from NLM staff try “What Are You Reading This Summer?” on NLM In Focus. Next Post: Five Years in Circulation…and Counting!